This post is brought to you by Savings.com. All opinions are my own. Make this super easy Black Bean Soup Recipe. 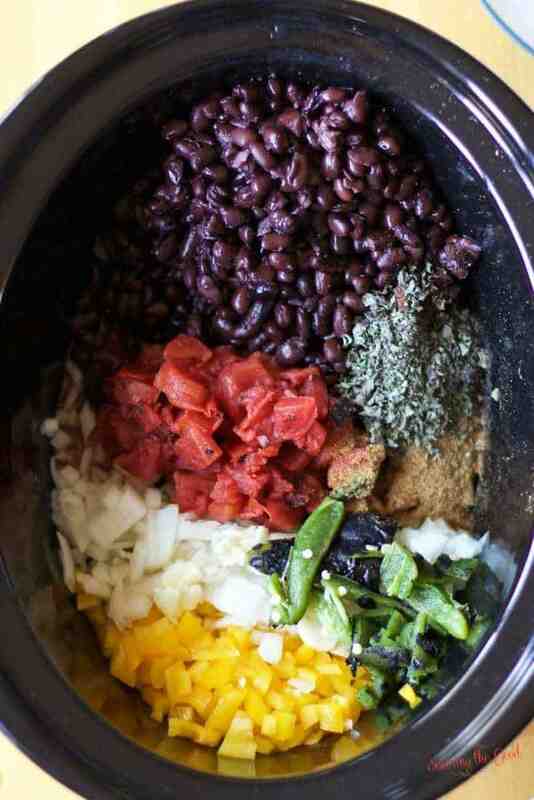 Crock-Pot Black Bean Soup is easily made in your slow cooker and is is packed with protein and full of flavor. When winter arrives warm up with a big bowl Black Bean Soup. This delicious soup is vegan, vegetarian and gluten free. If you are looking to expand your slow cooker recipes I would love if you would consider crockpot ham and potato soup, crockpot chicken tortilla soup, crockpot Mexican corn and chicken soup or even cabbage rolls. This is a comforting recipe that will fill your home with mouth watering fragrances as it cooks. With football season here this is a great recipe to have on hand for all your football parties. Make a soup topping bar with fun toppings for your friends to customize their soup to their liking. This soup is not a pasty thick soup but more broth based with delicious black beans and vegetables. Serve with a few slices of avocado, a sprinkle of cilantro and a squeeze of lime. Or how ever you like to enjoy your soup! I have a gas stove so I am able to easily roast my own peppers. This is a great money saver! I have full instructions on how to roast peppers in this post: How To Roast Peppers. Note: I didn’t remove the char from the peppers for this recipe but I did remove the seeds and membranes. Feel free to leave the seeds and membranes if you like the extra kick of heat. Dice the jalapeño for this recipe. Drain and rinse your black beans. In your crock pot slow cooker combine all the ingredients. Remove 2 cups of beans and vegetables and puree. This will thicken the soup and give it a lovely viscosity. This is my family’s cabbage roll recipe and you will be surprised how easy they are to make. This is the ultimate comfort food from the old country. These are some of my favorite winter slow cooker recipes. If you are looking for some good winter soups to warm you from within, these winter crock pot recipes will surely hit the spot. This collections of easy winter soups will bring you delicious bowls full of comfort. There is nothing more comforting that a warm bowl of ham and potato soup on a cold winter day. This cheesy crockpot ham and potato soup uses up leftover ham, potatoes, corn and peas. Set your crockpot in the morning and come home to delicious soup your whole family will love. When you are thinking about beach vacation meal planning these crock pot meals will help make your time in the kitchen short when you are trying to put together vacation meals on a budget. When winter arrives warm up with a big bowl of Crock-Pot Slow Black Bean Soup. This delicious soup is vegan, vegetarian and gluten free.This is a comforting recipe that will fill your home with mouth watering fragrances as it cooks. I have put together 19 crock pot recipes to help you have a laid back New Years Day. I love New Years day because it is the last holiday of the busy holiday season. I feel it is the most laid back holiday out of them all. If you love chili but don’t love beans, this easy beanless chili recipe is for you! Full of protein and all the flavors of a traditional chili this easy chili recipe will sure to become a family favorite. Don’t remove ALL the beans and vegetables, just enough to thicken the soup slightly when they are added back in. You are welcome to puree all the vegetables. Do what works for you. This crockpot Mexican corn soup has layers of flavor that include shredded chicken, black beans, creamed corn, Mexican spices as well as a creamy broth. Sous vide beef burgundy is an easy recipe to introduce you to sous vide cooking. Combining the techniques and flavors of a traditional beef burgundy with the advanced technology of sous vide cooking will make you change the way you cook beef burgundy forever. If you are looking for an easy fish taco recipe you need to make my easy Mahi Mahi taco recipe. The Mahi Mahi in this delicious fish taco recipe is tender yet firm thanks to the use of the Sous Vide cooking method. Give the Mahi Mahi a quick pan sear in a cast iron pan for a crispy exterior to the fish. This quite possibly is the best Mahi Mahi fish taco recipe you will have without going to the beach! This cheesy crockpot ham and potato soup uses up leftover ham, potatoes, corn and peas. Set your crockpot in the morning and come home to delicious soup your whole family will love. When winter arrives warm up with a big bowl of Crock-Pot Slow Black Bean Soup. This delicious soup is vegan, vegetarian and gluten free.